You’ll probably need to run this through translate.google.com, this this site, by Takeda Toshiya, has this nifty utility that’ll run some MS-DOS programs at the command prompt from Windows x64! It’s best geared towards command line utilities, but it seems to work fine for little (old) stuff.. nothing too fancy though the CPU core is taken from MAME’s i86 (which looks heavily influenced from pcemu). Today is a slow internet day. 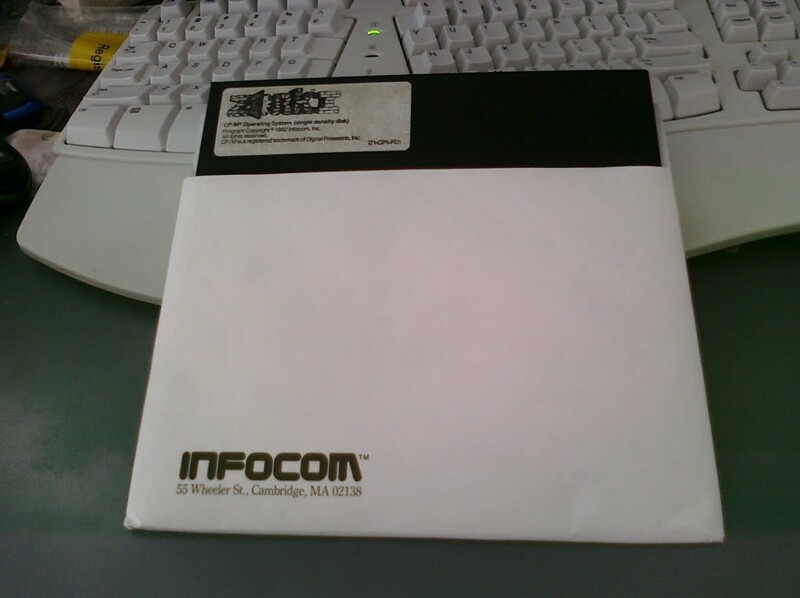 I just got back from a trip, so here is a quick shot of the 8″ diskette of Zork 1 for CP/M… I put it against my keyboard for some sense of scale.. It’s MASSIVE. I also found this Infocom interpeter written in Turbo Pascal, written by Martin Korth. It was written for Turbo Pascal 4.0, but I’ve built it with 5.5 and 7.0 without issues. 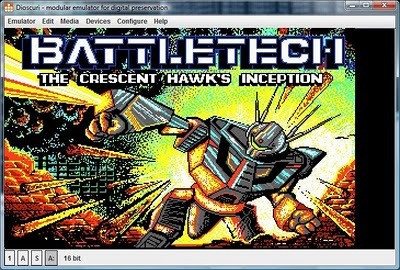 A friend of mine pointed me towards this new emulator PCE that looks very promising.. It boots off real IBM ROMS! 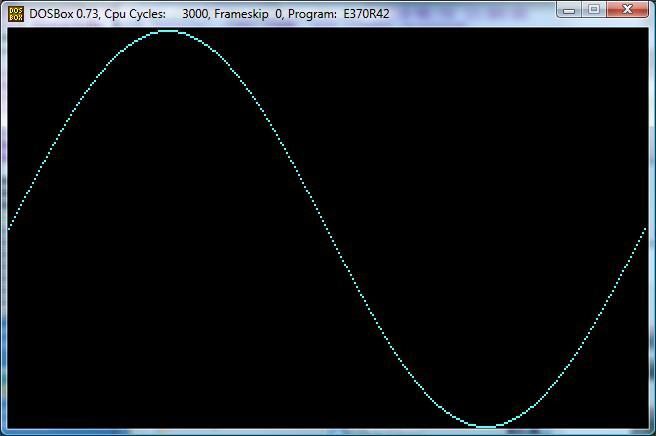 Right now it’s 8086/80186 capable, but it’s still VERY cool. Word is the author is working on Sparc32, ARM & PPC emulation… It looks very cool. Thats about it for me! I guess other then that, I didn’t even try for sound… As a matter of fact, I think I’m pretty much done with UnixWare, but at the same point it’s a little more ‘fun’ then I found it. I’ve never messed with CPM/86, as by the time it was free’d it was a dead end 8086 OS. 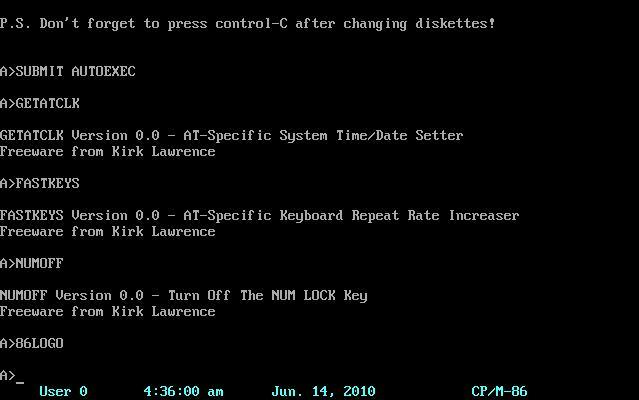 Like all CP/M OS’s it doesn’t support directories, or have that large of a base of applications, as CP/M was primarily a 8080/Z80 OS… (I can only imagine how many CP/M 86 apps there are…!). Anyways some strange googling led me to this 8080 emulator for CP/M 86 written by David Evans. Well that’s certainly interesting, all I remembered about 8080 CP/M emulation back in the days is that most of them required a NEC V20 CPU, as the V20 had some hooks for emulating a Z80. I guess in many ways, the same was true of the 8086/8088. So I figured this would be a great time to give this thing a shot. The first thing you’ll need is a copy of CP/M 86, and for this I’d recommend this version, as it’s been setup for IBM AT’s, and also it has a definition for a program, 22disk to copy files onto the CP/M disk, as CP/M doesn’t use FAT, and is incompatible with MS-DOS. To build and use the whole thing, I’m using Virtual PC, although I’ve tested the end product under Qemu. Unzipping 144cpm86.zip into a directory, you can simply run ‘makedisk’ and it’ll fireup the disk copy program, and ask you how many copies to make, and it’ll then write out your CP/M 86 diskette. You can boot it up once it’s done to make sure it works…. Now we can run ‘cmenu’ as an interface to the CP/M 86 diskette. The first time you run it, you must go through steps 1&2. Since we deleted the existing definitions there is only the 1.44MB format, so you can’t choose wrong, hit enter a few times and it’ll set it up. Next under option #2, just answer ‘a’ (without quotes!) and that’ll have the a drive setup to read/write the CP/M diskette. Test this by choosing option six, and hitting enter.  Verify that you can see the directory. Now extract the file 8080.cmd from 86emulat.zip. Next extract all the zork files from zork123_80.zip. Now launch cmenu again from 22disk, and then choose option four. simply type in 8080.cmd , then hit enter to accept it using the same MS-DOS name. Now run option four again, and now you can use wildcards, enter zork*.* . Ok, now we have transfered our emulator, and the test programs, you can reboot your VM with the floppy in the drive. Qemu users will have to specify “-no-fd-bootchk” to bypass the signature check as CP/M 86 (and MS-DOS 1.x) don’t have this ‘feature’. Now with CP/M 86 booted up, type in “8080”. This will launch the 8080 emulator, and print it’s banner. 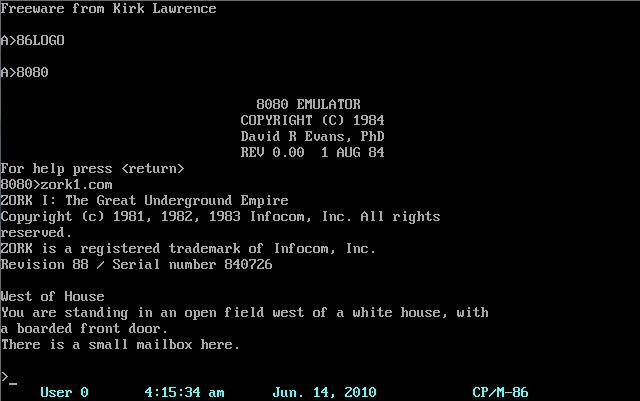 Now we just type in ‘zork1.com’ to start the zork1 game. After a minor pause, Zork 1 should now be running! And for anyone who doesn’t want to jump through so many hoops.. here is my CP/M 86 boot diskette with the files already transfered. 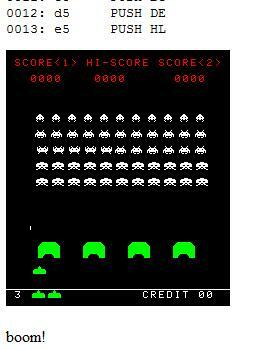 Well I forget what it was I was looking for, but I came across this great site, all about Vintage BASIC, and some various GAMES! Now back in the 1970’s and early 1980’s BASIC was quite different then it is in it’s current Microsoft incarnation as Visual Basic .NET. But not all that surprising is that Microsoft was a popular BASIC distributor to the microcomputers of the time, supplying BASIC for Commodore, among others, wikipedia has a great list of all the variants of their 8 bit rommable basic. 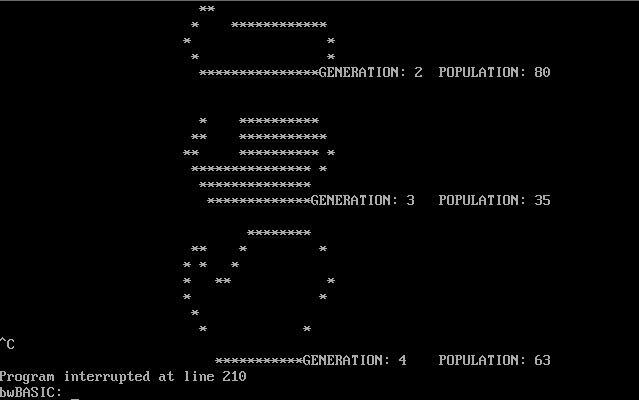 Back in college a friend was just a little obsessed with basic (he probably still is) and he was all happy as hell to have found this little interpreter written in C, that we could run on the RS/6000 called Bywater BASIC. Now while vintage-basic has this basic interpreter written in Haskell to run the programs, I thought I’d see if I could get some to run on Bywater. First was picking a version, and building it. I found that version of 2.5 was the easiest to build on my NeXT, and with a minor amount of hacking, even windows.. bwbasic needs a BIG stack… so 16bit stuff is out, but I guess it doesn’t matter as they had Quick Basic, and the old MS basic so this would be redundant. 4 PRINT TAB(15);"CREATIVE COMPUTING MORRISTOWN, NEW JERSEY"
8 PRINT "ENTER YOUR PATTERN:"
I should also add that the history of Bywater basic is kind of interesting it was started by Verda Spell, the grandmother of Ted Campbell who released it into the public domain. diskette. I have revised it slightly prior to this release. I found this link where someone had implemented a virtual NE2000 for DosBOX, allowing you to run among other things DOOM! This reminded me of my own work to add pcap into Qemu back in the 0.9.0 days… SO I figured I’d try to build the thing out and see how they interact! 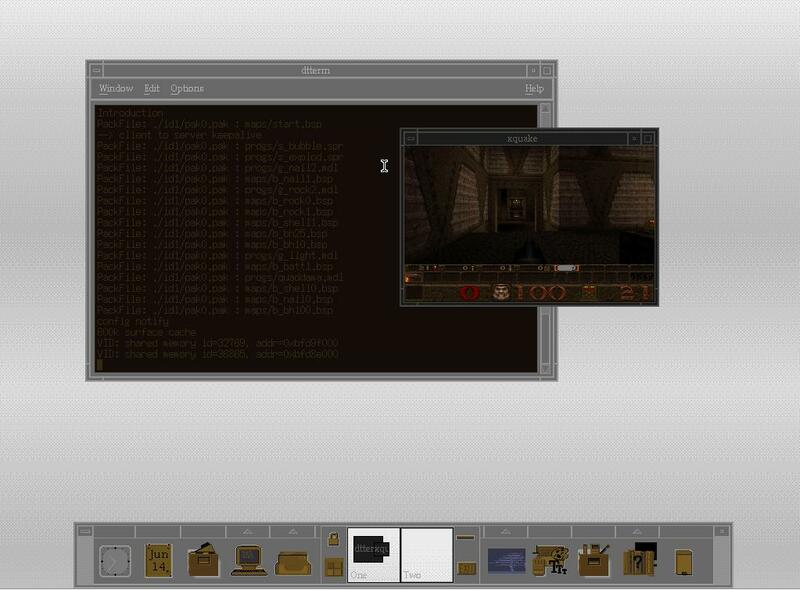 So the first thing to do was build DosBOX, and add the patch. I found that 0.73 worked pretty well for this! So after some hammering around, I got it to build, and launched it on two separate machines (one over terminal server) on my lan, and launched the oldest network doom version I could find to get things going. And there we go. 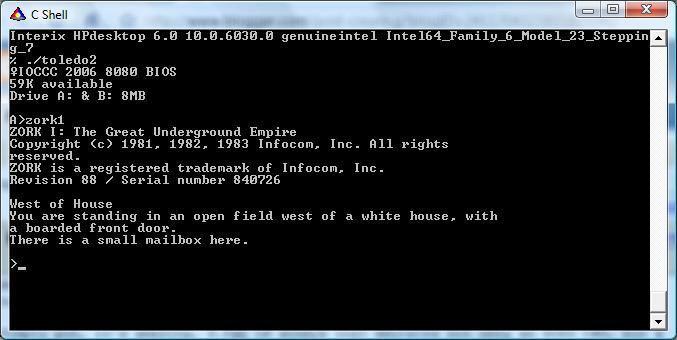 Now in the dosbox.conf you have to make sure that they have unique MAC addresses, and of course, that they are bound to the correct physical nic. in the config file, there is a list option that will print out the possible choices then you can just put the number, or the full name into the right spot on the ini file. I’ve build a prebuilt win32 version of this with all the DLL’s and the gravis ultrasound enabled… You can download it here. The next thing I did was search high & lo for my patches to Qemu, and thankfully I’d emailed them to myself as it seems all the other places are dead… So with a little playing with Qemu 0.90 to enable the adlib, and remove some logging messages, I’d built a client machine again with Doom. Naturally I had the DosBOX & Qemu face each-other off.. Sadly this is a little SLOW. For those that wish to download, you can find the Qemu client & server files. Now for Qemu, you’ll need to get that full NIC name… Dosbox provides a great way to see what it is, just paste it into the batch files, and you’ll be good to go. And remember you’ll need WinPcap installed!!!!! !